Knot is a 3D Celtic Knot generation and rendering application for exploring different types of randomly generated knots. Most Celtic knots are only sort of 3D, in that they only use the third dimension for weaving the string, but otherwise exist on a plane. Knot will allow you to render these 2D Celtic knots in 3D. 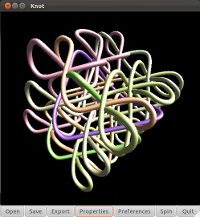 However, it also allows you to generalise these knots to create 3D Celtic knots rendered in 3D. Generate random 2D and 3D Celtic knots, rendered in 3D. Dynamically change knot attributes like thread thickness, size, weave height, etc. Colour the knot threads to distinguish different loops. Experiment with both traditional and less standard knots. Save knots for future reloading. Export the knot models as a Stanford .ply files for loading into 3D modelling software. Print out exported models as physical objects. Generate both symmetrical and non-symmetrical knots. 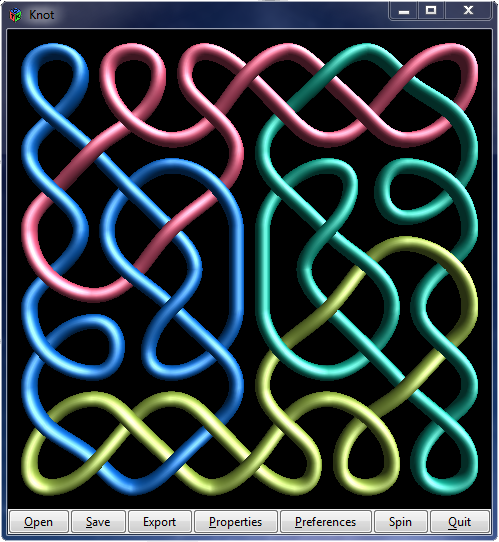 If you'd like to play around with some 2D knots before downloading the application, you can try out my Celtic Knot Web App. You can also read about the reasons why this application was created in the first place. For bug reporting, discussion forums and other useful tools see the Knot project pages on SourceForge. Click the icon for the Knot news RSS feed. Download the latest version of Knot in one of the following formats. About a week ago SourceForge suffered what seemed to be a catastrophic outage, taking everything offline. I realised when some of the tools I use for continuous integration and syndication started to complain at me. I'm pleased to see things are getting back to normal. Both Functy and Knot3D are hosted on SourceForge and both are now back online. SourceForge is an important site from an Open Source perspective and I feel for the SourceForge team who clearly have had to do a lot of work to piece everything back together. 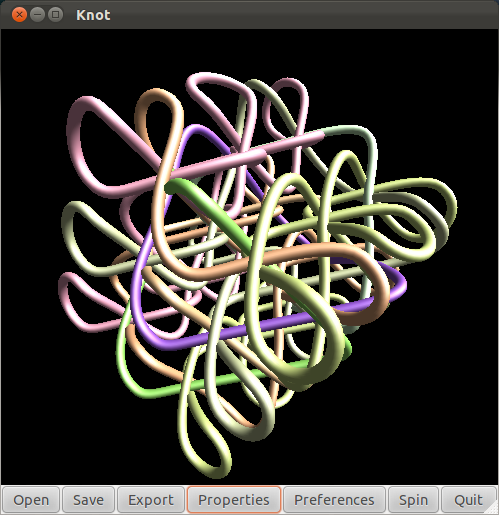 Knot3D is now also available as a daily build from my Ubuntu Launchpad PPA. If you're using Ubuntu, it's by far the easiest way to install and keep it updated. Now sporting its new name, along with a bundle of bug fixes, a new version of Knot3D is now available. 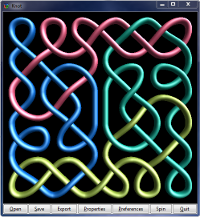 Knot3D is an open source (MIT-licensed) Celtic knot rendering program. As well as traditional flat knots it'll also create full three-dimensional cuboid knots, which can be output as mesh files for rendering or 3D printing. Installers are available for Linux and Windows (as well as the sourcecode if you're using something else). Knot now has a new name: it's now called knot3d. It's not a massive change, but an important one since it turns out there's already a (very different) Debian package called knot. The new name is to avoid it clashing. Thanks to Daniel Matthews for highlighting the issue! A package arrived recently from Shapeways containing some 3D printed jewellery generated using Knot. You can see (and even print your own!) copies of the bracelet and ring from the Shapeways site. Version 0 (1 Jul 2013) for Linux and Windows.